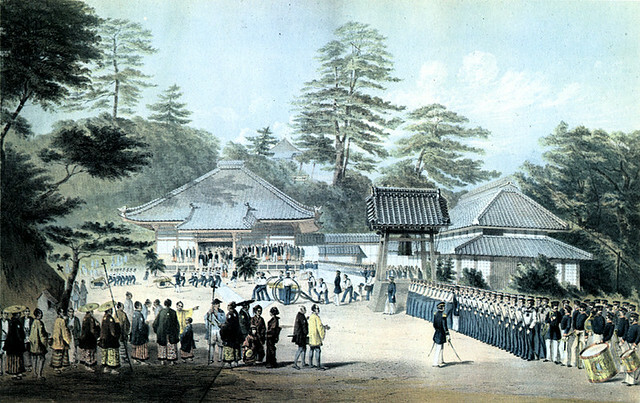 Above is one of the images we had access to during the Visualizing Japan course offered as a Massive Open Online Course (MOOC) through EdX. It was the first time I shared an online course with our community. I wanted to understand better the potential of online learning and how OIS could incorporate it into our curriculum. We do offer Pamoja Education courses to our IB Diploma Programme students, although none have taken up the offer. Without this MOOC, I never would have access to professors at MIT, Harvard and Duke or the archives they used find images for us to analyze. The ability to listen again, pause and read the transcript to the lectures by the professors was invaluable to me. In a face to face class, one is limited to taking notes, but the ability to watch it again, can’t be done unless the lectures are being recorded and uploaded, which by the way, some of our teachers are experimenting with. It did require a time commitment of at least 2-3 hours per week, so I gave up my personal reading time to complete the course. Earning a verified certificate at a cost of $75 encouraged me to finish, although people can audit the course for no charge. The disappointing facet of the course was the lack of discussion. There were online discussion forums, but wading through the comments and posts didn’t inspire dialogue. EdX didn’t require any long written essays or research papers/projects which helped me as a busy professional and father/husband, complete the course. The students would enjoy this course and next time I will definitely share it with them. Beside EdX, Coursera is another site that offers access to university courses around the world. I saw that next door neighbor Osaka University is offering a course on immunology and the next course in the Visualizing Japan series is through the University of Tokyo (Visualizing Post War Tokyo Part I). I am considering doing that course as well for a certificate. The course gave me a deeper appreciation of Japan and will make my experience here much richer. Some of the SIS faculty said they were fascinated with hearing the perspective of a foreign country on their history. There were only a few takers of my offer, I thought there would be more interest. My guess was the time commitment prevented people from joining in. Online learning in my opinion is here to stay and will only become a larger part of the regular student’s day in the future. I don’t see online learning taking over from traditional teaching, but it will be used as a tool by teachers and schools to individualize and enhance the student learning experience.